Reading online about the journey from Pai (or Chiang Mai), Thailand to Luang Prabang, Laos was quite daunting. We had read many horror stories and began to dread our prospects. There were several options, and each had a long list of complaints and critiques. At the end of the day we chose the path most traveled, and we bought a ticket for the 3-day slow boat. On Saturday, we headed down to aYa travel agency in Pai and grabbed a packaged journey to Luang Prabang. For a five hour bus ride to Chiang Khong, one night’s stay (breakfast included), and two days on the slow boat, it cost us 1750 baht ($61 CAD) each. On the second night, we would have to spend a night in Pak Bang on our own dime, which was not included in the price. Sunday evening we left at 6:30 PM for our second round at the 762 curve drive to get out of Pai. It was pitch black and Samie was struggling a bit with the curves this time around (she hates night driving, let alone speeding around twists and turns). After about two hours, we finally mastered the hardest part and were on a straight away to Chiang Khong. We got into Chiang Khong late at around 2 AM and checked into a less-than-ideal hotel. We were exhausted, so it didn’t matter that much to us. A lot of reviews online complained about the hotel but really, for a few hours it’s not bad at all. We had our own room with an en suite bathroom. It wasn’t entirely cleanly, but we closed our eyes and pretended we were at the Hard Rock Hotel and drifted off. In the morning at 7 AM, we got free scrambled eggs and toast and took some passport photos for 100 baht ($3.50 CAD) before jumping into the back of a truck and heading to the border. 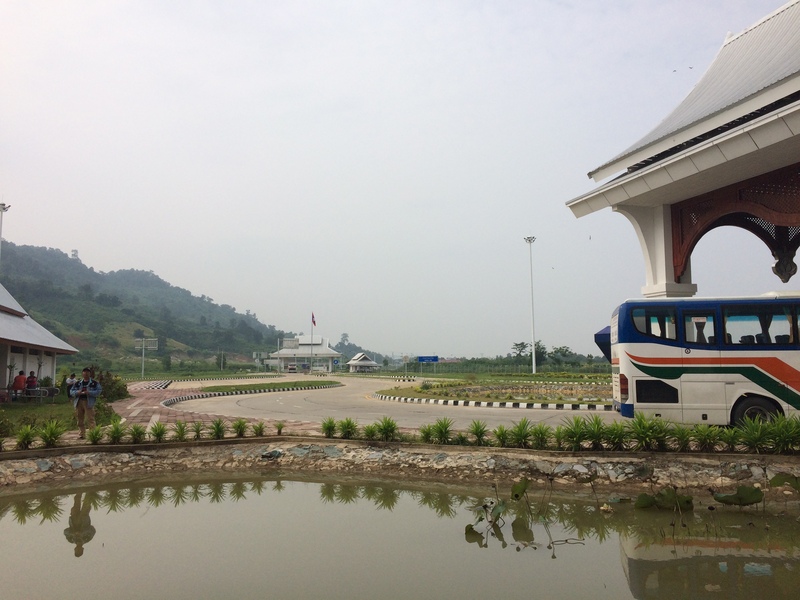 At the border, we needed to pay 20 baht for the shuttle to cross the friendship bridge into Laos. Once at the border, it was pretty painless. Again, we’ve heard that the visa process can be a nightmare but luckily it wasn’t busy at all when we arrived at 8:30 am. We had to go to a counter, get our visa ($42 USD for Canadians — we’re the only country that had to pay that much! ), and give them our passport. After about 10 minutes, they called our name and we got our passports back. I can see how easily this could be a big mess, but again we were lucky. 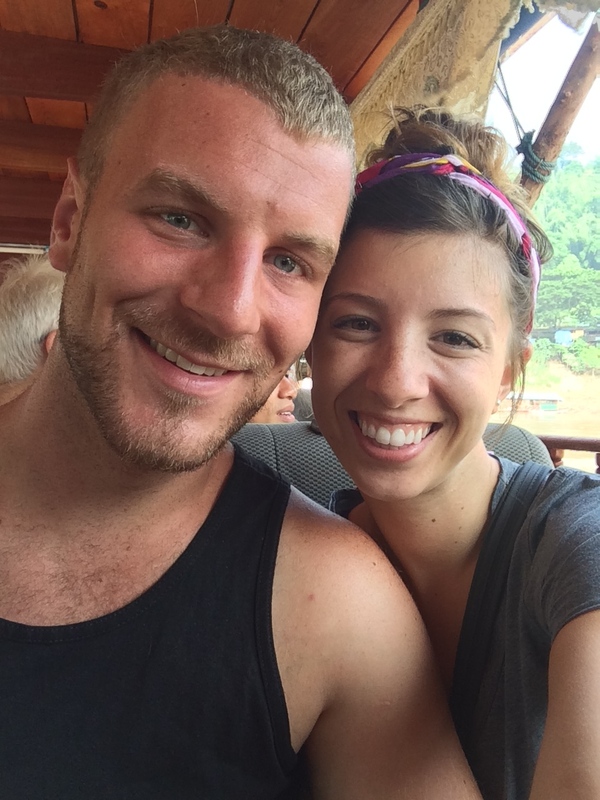 After we had our visas, we headed to the slow boats 10 minutes away. Once there, we grabbed some sandwiches from a local café and boarded the slow boat. The guy running the tour told a few fibs, such as ‘the boat wasn’t even at the dock yet’ (when it was, and already almost full 20 minutes prior), and that he had booked reserved seats for us at the front of the boat (it’s actually impossible to reserve seats). Thanks to him, we were all pushed to the back of the boat right next to the engine, which was extremely loud. Luckily, there was a lot of floor space at the front of the boat, and we went up for fresh air and sat on the floor with a bunch of other travellers. The view was spectacular and the breeze was perfect. The locals on board had cute toddlers playing with everyone and the captain let some people sit at the bow of the boat outside. The boat had old van/bus seats throughout for passengers to sit on, which was nicer than other boats which have wooden seats. We heard most of them are being upgraded to these sort of seats. For a five hour journey, it was a really nice way to go. The views were unbeatable, and we got to see water buffalo, stray dogs, goats, and locals clear-cutting and farming the mountainous hillside. The Mekong River winds through some incredibly lush, dense jungle forest – the kind of stuff you expect to only see while watching Jurassic Park. When we arrived in Pakbang, we stuck with some travellers we met and walked up to the town. Avoid the tuk tuk offers — you won’t need them! It’s a short 5-10 minute walk into the city where there are tons of guest houses to choose from, ranging from about 30,000-50,000 kip/person ($4.25-6.25 CAD). We found a private room for 50,000 kip called Vassana. It was clean with wifi and cold showers. For the price and location, we were happy. The power went out a few times (but we heard this is normal for Laos), only lasting for about 20 minutes. We went to dinner with some American friends we made and went to bed early since the boat was leaving at 9 AM. The boat was scheduled to leave at 9 am, but it didn’t leave till 10 am (but, we’re on Laos time, so this is to be expected). We got to the pier at 8:30 am to get a nice seat right up front. 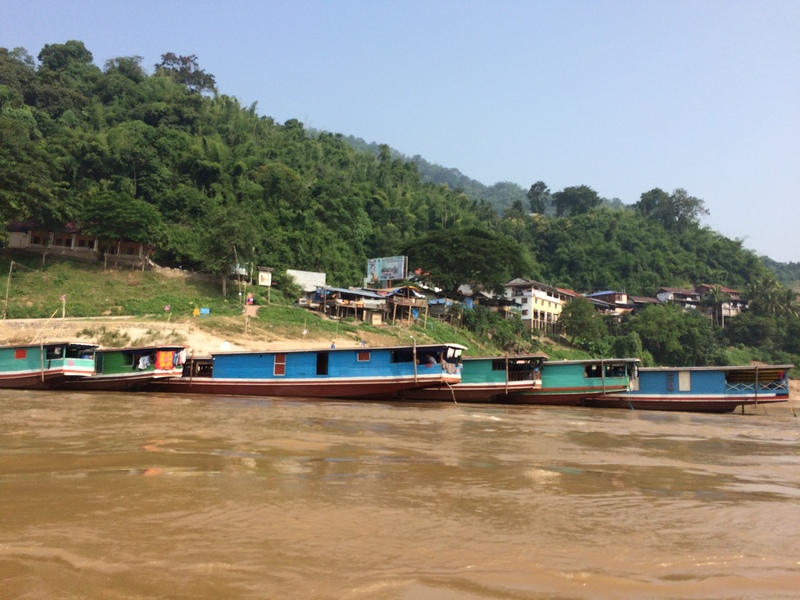 Once we got moving, it was an eight hour trip to Luang Prabang. A note to anyone thinking of taking the slow boat: bring food! We only brought a few sandwiches and were pretty hungry by the end of it. They sell ramen noodles, beer, pop, and chips on board, but nothing of substance. 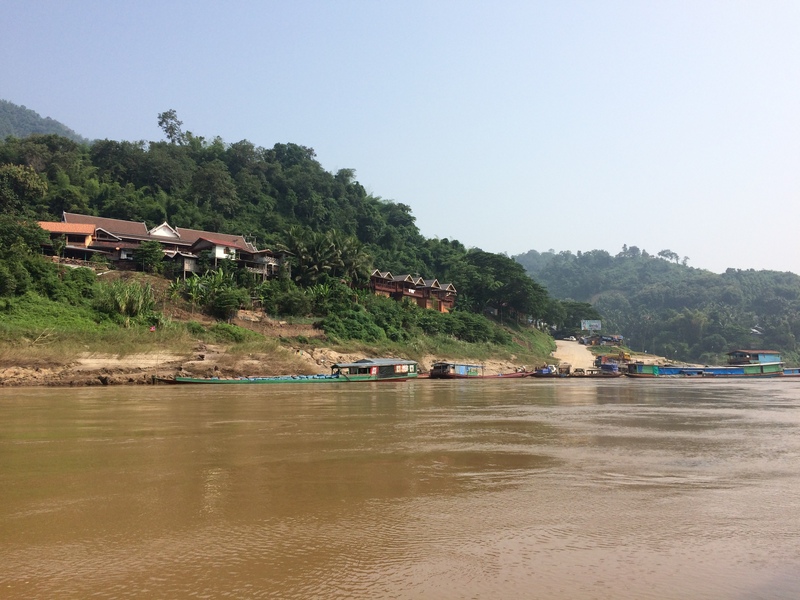 We arrived in Luang Prabang around 5 PM, and the boat didn’t take us to the proper pier. We had heard this was a common scam happening these days. There is a pier downtown, but the boat instead takes you to a shoreline 10km outside of the city claiming that the downtown pier doesn’t allow for passenger boats to dock. A woman on our boat was getting pretty mad with the captain, but he didn’t seem to care. This part sucked a bit, but we had expected it. We walked up a huge sandbank to the road where the tuk tuk’s were offering obscene prices (20,000 kip/person, or $2.50 CAD) for a ride into town. Considering tuk tuks usually charged no more than $1.50 total for a ride, and these tuk tuks were filling up with 6 people at a time, it was a pretty clear cash grab. Some friends and us decided to walk a few minutes before we finally found one we were comfortable paying. We payed about 10,000 kip each, 60,000 total ($7.50 CAD) to get into town. We wouldn’t advise walking all the way into town, since it was definitely a hike. Overall, we really enjoyed the experience. If you come into it with no expectations, it’s really not that bad. Yes, the sleeping arrangements weren’t five star, but who cares? On a shoestring budget, the slow boat provided the best views, time to relax, and opportunity to meet some new friends. Ha ha! Great post! It totally blows me away how much you guys have researched this trip! Every issue you run into is predicated with “we’d read about this before”. You’re probably avoiding a ton of errors this way, but the studying must have been gruelling!! Thanks Christa! Between Samie’s need to be prepared for EVERYTHING and my rampant curiosity, we do a lot of researching 😛 It’s kinda fun to hear what all the other backpackers have to say about this trip… it means we can skip the boring/sketchy parts, and focus on the golden parts.